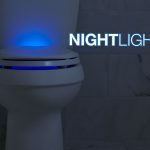 Tired of your old, leaky, water-guzzling toilet? If you’re in the market for a new one, there are a lot of options to consider. The distance from the floor to the top of the toilet bowl rim makes a big difference. 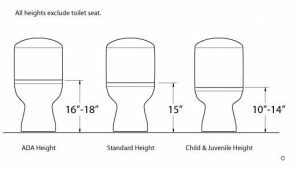 The trend is to buy taller 16-18” ADA compliant or “comfort height” toilets. Other options include the standard 14-15” height and a low 10-14” child height. Two-piece toilets have separate tank pieces and bowl pieces. Although they are most common and less expensive, they are more difficult to clean. 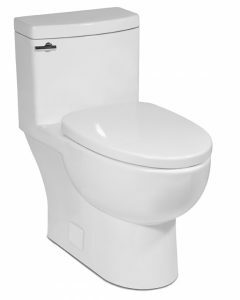 One-Piece toilets are smooth and easy to clean, but come with a higher price and are quite heavy. While we’re talking about easy-to-clean toilets, think about purchasing a “skirted” one which has an easy-to-clean smooth base instead of the usual visible squiggly pipe which can collect dust and grime. Below is an image of a one-piece skirted toilet. 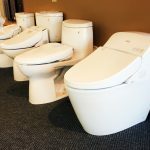 We suggest sticking to a white or off-white toilet so you can find replacement parts easily, and your toilet will stay in style for years to come. Most toilets place the flush-handle on the left side of the tank. 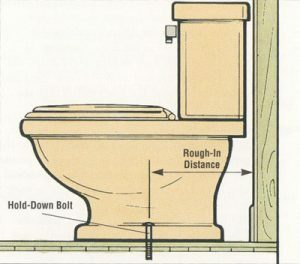 If your toilet will be up against a wall, make sure there is enough room to reach the flush handle. If this could be an issue, purchase a toilet with the handle on the opposite side or on the top of the tank. Make sure to measure the distance from the wall to the flange bolts on the base. 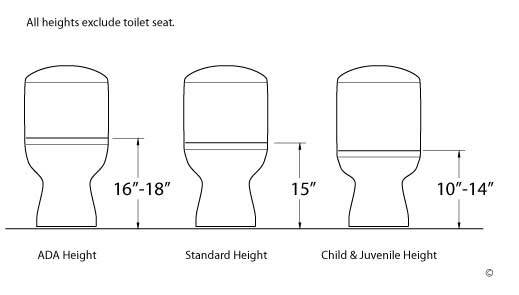 Commonly, toilets are twelve inches, but they can vary. 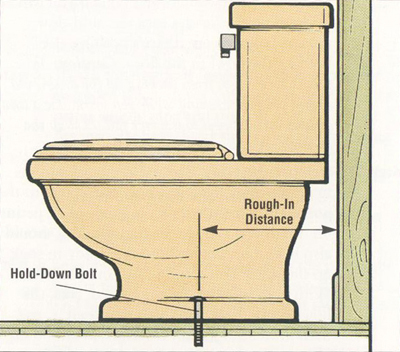 If you purchase a toilet with a larger rough-in distance than your previous toilet, you might have problems. Elongated bowls are replacing round bowls in most homes. They are much more comfortable and hygienic for adult use. Yet, elongated bowls can be problematic in small bathrooms. The extra length can get in the way of cabinet drawers and doors. 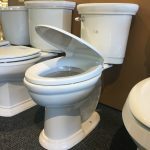 If you are considering replacing your round toilet, make sure you have at least two inches of extra room at the front of the bowl to spare. Most toilets do not come with a toilet seat because there are too many options available! The most important feature to focus on is whether you need an elongated or round seat depending on the bowl shape. After that, the options are endless. 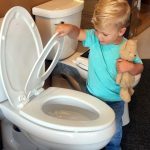 Choose a traditional seat, slow close, night lighted, heated, potty seat, or washlet! Each option comes with benefits depending on your preferences. 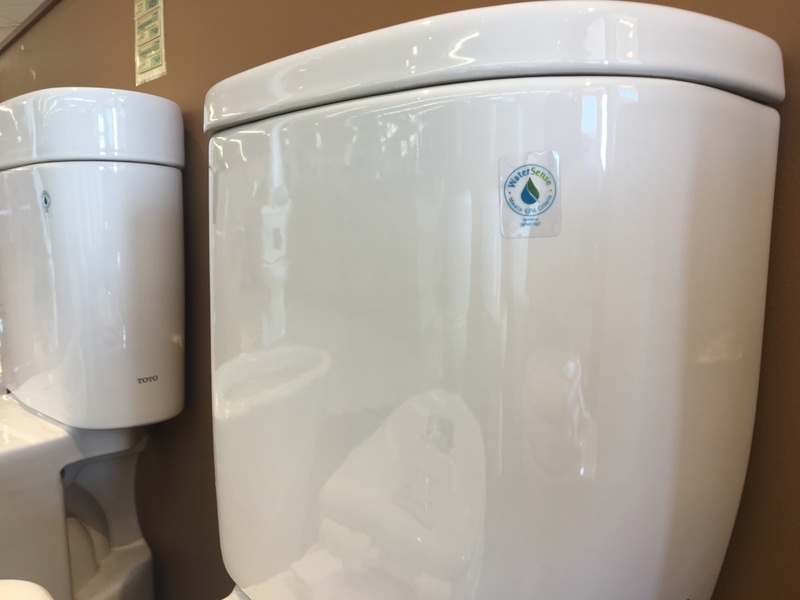 Most new toilets come with an energy-efficient rating. The old toilet you are replacing can flush up to 5 gallons with each use. Modern, efficient toilets use as little as 1.28 gallons, saving you hundreds of gallons of water and saving on your water bill each year. You will also need a few items for installation. A new wax seal, new water supply line, and some tools to put it together – an open-ended wrench, screwdriver, rag, gloves, and a garbage bag. 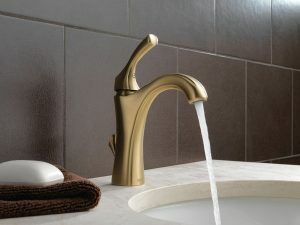 Gold Faucet Finishes: Unlike the polished brass of the 1980s, the brushed gold that is emerging in the remodeling industry is sleek and modern. The bright color brings warmth into your bathroom. Integrated Technology: More and more technology is being integrated into bathrooms. From Bluetooth showers and motion-sensor faucets to lighted mirrors and humidity-sensing bath fans, these inventions are making it easier for you to get on with your day! Colorful Vanity Colors: Classic bathrooms are always on trend. However, adding a pop of color can brighten up the room. 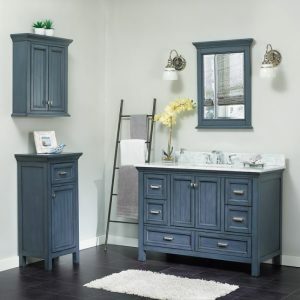 Choose a vanity in bold blue or sage green to stand out among the rest. 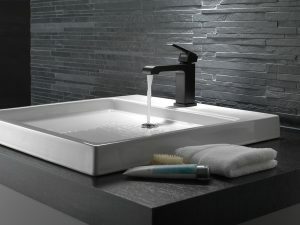 Black Fixtures: Black faucets are everywhere in 2019. Their dark contrast makes them stand out in a light-colored bathroom. They look great with natural stone vanity tops. Spa-Like Designs: Self-care has become a real focus in the last few years. By remodeling your bathroom to include a few spa-like features like a soaker tub, a steam shower, and earthy tones, you might just start your day off a bit less stressed than you used to be. Statement Mirrors: Decor is the easiest thing to change in a bathroom. 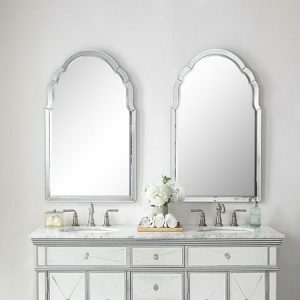 By hanging a unique mirror in your bathroom, you can create a bit of whimsy – especially in powder rooms where there isn’t need for extra storage. Clean Lines: Eliminate the ornate filigree with modern no-nonsense fixtures. Minimalist designs make cleaning easier and the lack of clutter can leave you less stressed. 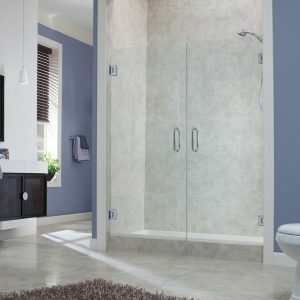 Frameless Shower Doors: The modern look of a frameless door is a great addition to any bathroom. Make your bathroom appear larger without the bulk of metal frames encroaching on your shower. Plus, these frameless doors leave you with less hardware to clean. Single Handle Post-Mount Faucets: These faucets are so user-friendly, they are really the only way to go. It is much easier to control the water temperature since only one hand is necessary for adjustments. Also, eliminate extra time spent cleaning. Just wipe down the spout and handle and get on with your day! It’s a beautiful, clean, and modern look. 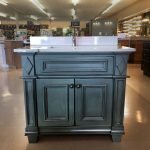 Shopping for a bathroom vanity is a lot like shopping for kitchen cabinets, a dresser, or even a table. You want something that’s high quality, lasts, and is fitting for the space. Your vanity will likely grace your home for some time. And not all vanities are created equal. We’ll help you find something that maintains its natural beauty for years to come. Your vanity can be constructed with various materials. We’ve listed the three most popular options in order of the most economical to what is generally the most expensive option. MDF (medium density fiberboard) is engineered from composite wood fibers and compressed together with a resin adhesive. It’s usually topped with a melamine layer for protection and decoration. This makes it a more economical option for furniture, kitchen cabinets, and bathroom vanities. Real wood or plywood veneer consists of thin layers of wood veneer glued together with a fine grain appearance. Real wood veneer is thick—made like fine furniture. A protective coating is typically applied on the outside of bathroom vanities. And you can also choose from a wood or painted appearance. This is a popular option and is often more durable than MDF. Solid wood vanities are made of lumber. They can have an attractive, rustic feel if a maker leaves the natural wood tones and knots exposed. Wood is naturally porous, so it can absorb moisture, expand, and potentially warp over time. This is not to say that manufacturers who use solid wood create inferior products, but rather that it’s less commonly used as it’s more expensive to construct a quality vanity from solid wood that maintains its appearance. Most of these materials have some type of outer protection to shield the vanity from moisture. Melamine is a coating that provides a smooth, protective surface. 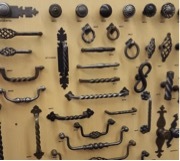 It’s used for different kinds of furniture and can be applied over MDF or plywood. A melamine coating can provide protection from moist environments and is less likely to scratch. Polyurethane, a moisture-resistant finish, is used by vanity manufacturer Ronbow, one of the brands Handy Man carries. When dry, it becomes hard like plastic and can withstand harsh environments. Other manufacturer brands Handy Man carries, like Bertch, use a thermoset coating. This provides stain and moisture protection. Bertch provides a “bulletproof” layer for high moisture conditions without deteriorating. Bottom line: opt for quality materials to prevent bubbling, warping, cracking, and damage to one of the most used areas of your bathroom. Quality craftsmanship extends beyond materials. How a manufacturer assembles a vanity impacts its durability and functionality. These fine craftsmanship features can save you from storage shortage and repair headaches later on. 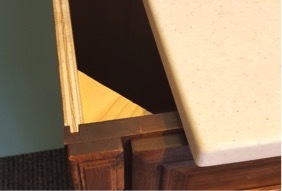 Dovetail drawers are sturdy. 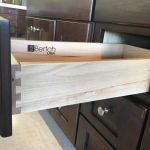 The interlocking angles prevent the drawer from coming loose—especially if you have young children who may pull on it. Slow-close drawers prevent the drawer from slamming into the vanity. 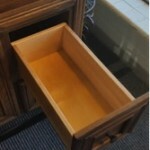 Full extension drawers allow you to access everything you put in the drawer with ease. U-shaped drawers fit around the sink pipe to provide even more storage. You wouldn’t squeeze a large dresser into a tiny room, right? You also wouldn’t buy dark brown kitchen cabinets when your entire house is furnished with light birch wood, right? Well, the same goes for your bathroom vanity. 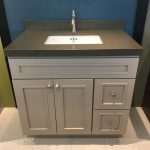 Because installing a vanity is typically one of the last steps during a bathroom remodel, you usually have a little time to order a vanity to your own specifications. 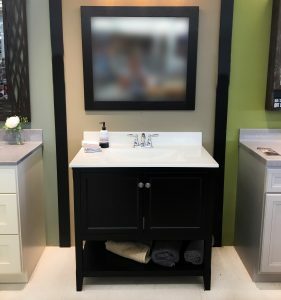 While custom vanity cabinets can have a lead time of 3 to 4 weeks, while you are installing your floor, tub, painting your walls, and more, you can be thinking about the vanity that will best go into your new bathroom. You can get just about any wood species or color. 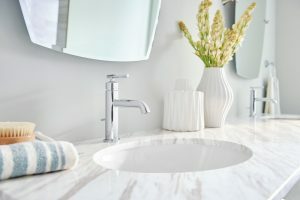 If you have existing color and design schemes that you’re trying to complement, bring photos of your current bathroom to reference while you shop. The same concept should be used to choose hardware. When you order your vanity, select your hardware. What you choose will determine whether the manufacturer needs to drill one, two, or no holes in the doors and drawers. Take the size of your bathroom into consideration when choosing your vanity. Vanities come in a range of widths, which increase in size in 6” increments. Standard sizes include 18”, 24”, 30”, 36”, 42”, 48” and 60”. And, like kitchen cabinets, you can fit pieces together to form an extended vanity. You’ll also need to choose the appropriate depth and height of your vanity. For a small bathroom, you can get a vanity depth of 18”. You can even get creative and install a pot belly sink for additional space. A full sized vanity depth is 21”. For height, you can opt for a tall vanity, also referred to as comfort height, which is about 36”. The standard height of a vanity is 32”, but you can get one anywhere from 30” to 36” tall. What’s the difference between a bidet and a washlet? Bidets have been a staple in European bathrooms for decades, but have had a slow transition into the United States. Simply speaking, a bidet is a separate piece of furniture from a toilet. Although it looks like a toilet, it has a faucet on the back and sits next to your real toilet. After using the toilet, you move to the bidet for cleansing. Many people don’t have space in their bathroom for both of these fixtures, and if they do they don’t want more things to clean. For these reasons, the bidet has never been very popular in America. On the other hand, washlet seats are growing in popularity. A washlet is a high-tech toilet seat with a water hook-up and spray nozzle in the back. Since it is basically a replacement to a regular toilet seat, there is no extra cleaning and it does not take up any extra space in the bathroom. A washlet seat works very similarly to a bidet but it has a few major differences. Instead of having a faucet in the back, it has a nozzle that sprays cleansing water from behind. When you sit on the washlet, you can choose a front wash or rear wash. When you’re ready, you will push a button for instantly warm water to cleanse you. 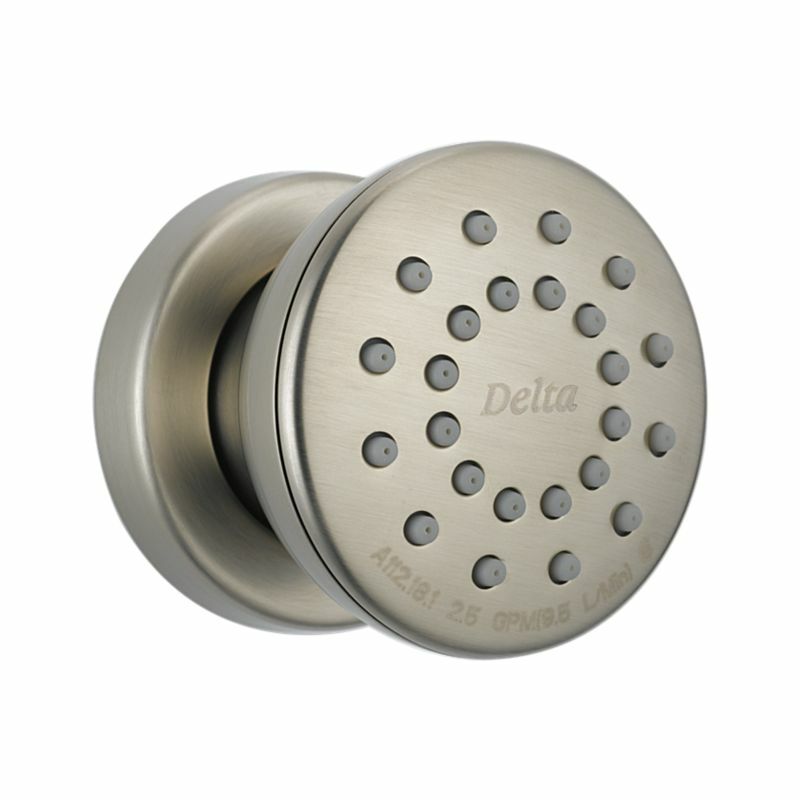 Many washlets have multiple settings for water pressure and movement to get you clean where you need it. Some inexpensive models found online are very basic and simply use cold water. At Handy Man, we have models that have their own heating element that provides warm water that oscillates to clean more of you, then blows warm air to dry you off. Most Americans are averse to the idea of washlets and bidets because of their unfamiliarity. But, if you ask anyone who has one in their home, they wouldn’t replace it for the world. There are a multitude of reasons to jump on the washlet bandwagon. Here are just a few. Cleanliness – Immediately after using a washlet or bidet you feel incredibly clean. Liken it to cleaning your countertops with a dry towel compared to a damp towel. The wet towel will always pick up more debris than the dry one. Hygiene – Rather than using toilet paper and spreading germs and bacteria, your hands are still clean after using the bidet. Most infectious diseases are spread by human contact, so the hands-free functionality of a bidet makes it a much more hygienic alternative. Better for pipes – On average, Americans use 50 pounds of toilet paper each year. This toilet paper clogs pipes and wreaks havoc on septic systems and city sewers. With a bidet, you can reduce your toilet paper usage to practically nothing. Asists elderly users – With a washlet, your older adult won’t have to bend and twist to wipe their behind. It will do the cleanup and they’ll just need to pat the area dry. It’s hygienic and gentle on senior’s delicate skin. Environmental impact – So, you’re thinking this sounds great, but what about all that wasted water? The footprint of a washlet or bidet is much smaller than you think — for each use, the bidet only uses 1/8 of a gallon of water. Compare that to the water used to make toilet paper (37 gallons per roll) and trees cut down each year (15 million) and the bidet is a much more sustainable option. If you’re still hesitant about bringing a washlet into your home, stop by our showroom where you can see one in action. Say goodbye to mortar, messy grout, and time-consuming tiling for your bath and shower. Introducing the Jetcoat™ Shower Wall System: A Grout-Free Solution! It only takes a few hours to measure, cut, and adhere to the wall, which makes this a perfect DIY project for most. Just 24 hours later, the walls will be cured and ready for use. With five ultra-durable premium finishes and three different configurations, you’ll never find an easier or more affordable way to give your bath the stylish and dramatic makeover you’ve been dreaming of. Decorators everywhere are falling in love with these long-lasting and sophisticated walls! Premium finishes available include Slate, Driftwood, Quarry, Sandstone, and Shale. The variety ensures there is a perfect style for everyone! Getting a new Jetcoat shower is incredibly quick and easy with the Jetcoat grout-free installation system. Although it looks like these are individual tiles, they are actually large panels that simply click into place with their tongue and groove edges. They fit so snug that you will have a hard time finding the seams once the panels are in place. The SPC Rigid Core panels are incredibly durable since they are made into a composite from natural marble powder and PVC powder. With 10 layers of strengthening and UV protectant mediums, these heavy-duty walls will stand up for years without worry of chipping, staining, or fading. 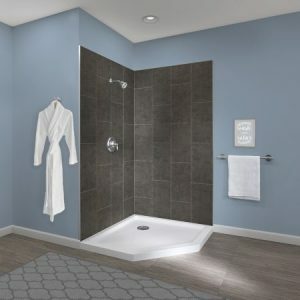 Jetcoat is a stunningly affordable option for anyone looking to install a shower. 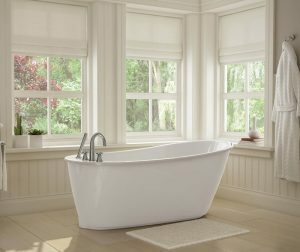 With multiple base sizes available and a 10-year warranty, replacing your old bathtub, standard shower, or corner shower is a breeze! You can also order a custom base from Handy Man and order Jetcoat walls to fit if you have a unique sized space. Come and see it on display at our showroom – you will love it! See the installation video here! 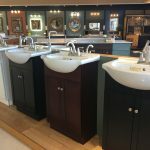 Jetcoat was created by Foremost, one of our trusted vendors for many bathroom products, including their bathroom vanity cabinets and shower doors. Congratulations to Andrew! 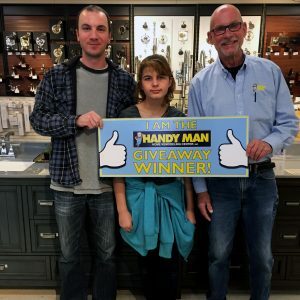 He took home our giveaway prize of $300 in store credit! He is pictured here with his daughter and our Lincoln store manager, Mike. We’re looking forward to helping him with his next project! Since the beginning of time (or the modernization of showers) people have been fighting mold. Why? Because mold LOVES showers! It provides the perfect conditions to grow – moisture, warmth, and edible nutrients (soap residue). It’s the perfect place for mold to live. The most problematic areas tend to be on the silicone sealant. 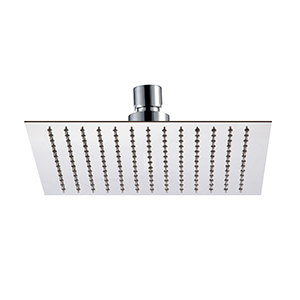 Its low thermal conductivity means that it is the warmest part of the shower. It also can be lumpy and retain excess moisture on its ridges. What causes mold and mildew in the shower? Mold spreads by microscopic spores that travel through the air. These spores land in your damp shower and immediately start growing on the sealant. They reproduce rapidly and you will soon see a visible dark spot growing on top of the sealant. If you catch this early, it is considered a Primary Attack. If you leave it there for an extended amount of time, the mold will secrete a substance that is able to break through silicone caulk and begin reproducing under the surface. This is called a Secondary Attack. Once the mold gets to this stage, the sealant needs to be removed and reapplied. Before you apply a new bead of caulk, the best way to keep mold from growing underneath is to thoroughly clean the area with a fungicidal spray. How can I keep my shower mold-free and fresh? Despite the constant struggle, there are many countermeasures you can take to prevent mold in the future. Clean off any mold or mildew as soon as you see it to prevent the secondary attacks. Consistently rinse the shower each time you are done using it. If you rinse out any soap bubbles on the walls or curtain, the mold won’t have anything to feed on. A hand shower is a great tool for this. It makes it easy to direct the water right where it needs to go. The most important step in mold prevention is to remove excess moisture. Bath fan ventilation technology has come a long way in the last decade. The best fans run at a low speed all day long to keep moisture out. When it senses a person in the room it will speed up for a set amount of time. Not only do these fans clear out bathroom moisture, but they also are incredibly quiet, and no longer roar like a jet engine taking off. One flaw of older or basic models of bath fans is that you take a shower in the morning, then leave the house. You don’t want to leave the fan running for 8 hours on full speed, so you turn it off before it gets a chance to do its full job. These new models run constantly and silently, which allows them time to complete their job – reducing moisture, mold spores, and odors. Handy Man carries a wide variety of bath fans to suit your every need – bath fans with night lights, motion sensors, and more. We’re here to walk you through it! 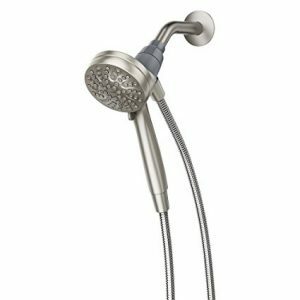 Here are a few shower heads that will make your time in the shower the most relaxing 8 minutes of your day! From calming rain heads, luxurious waterfalls, massaging body sprayers, removable hand-held shower heads, and more… Handy Man has got you covered! 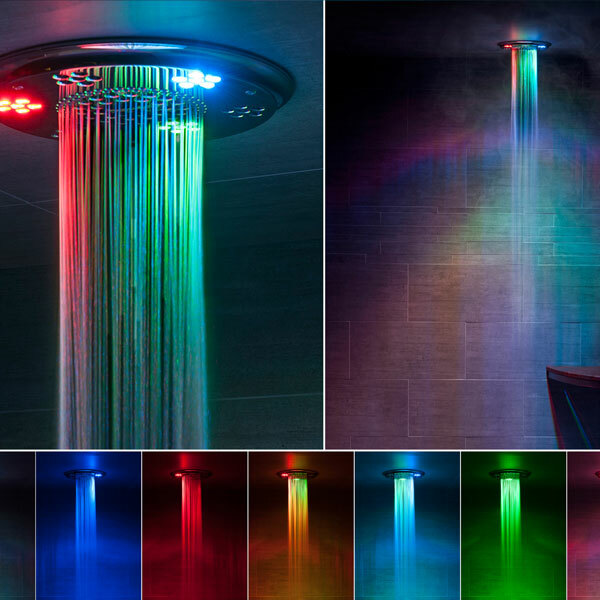 Bring your shower into the future with this ultra-thin rain shower head. The clean lines can modernize any bathroom! This multi-function shower head includes a rain head and waterfall feature that transports you from your bathroom into the jungle. After a tough workout, body sprayers are a must. They massage away tired and achy muscles to leave you feeling rejuvenated! Cleaning the shower, washing the dog, and rinsing all those hard-to-reach places has never been easier! 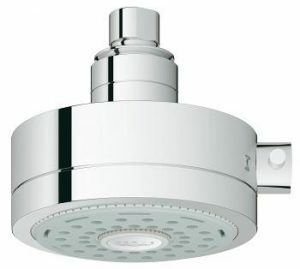 With Moen’s Engage hand show with MAGNETIX, your hand shower will always snap back into place after use! 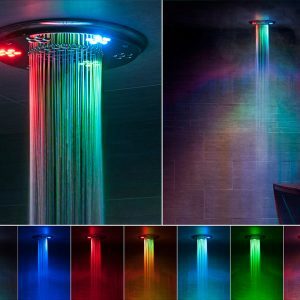 Rejuvenate yourself in a shower enriched with chromotherapy! Each color has a different energetic property. Choose purple light to relax before bed or orange light to energize you before a big meeting. Congratulations to Sheila from Lincoln! 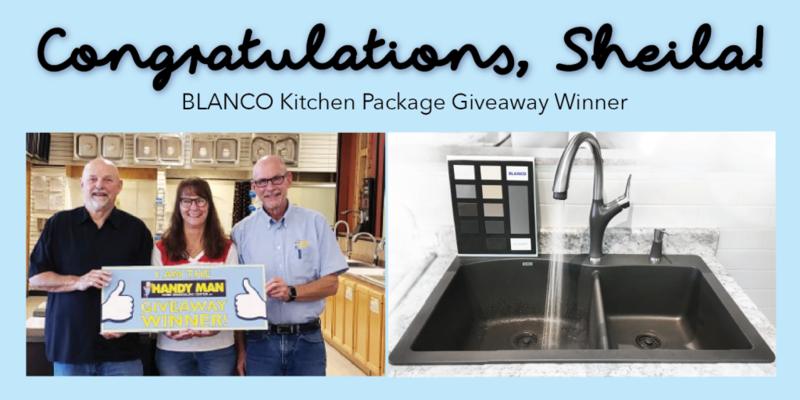 She took home a new Blanco kitchen sink and matching faucet (valued at $900) for her home! Thank you for participating in our giveaway! 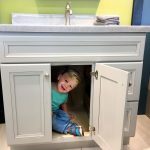 By choosing pieces that add extra storage and also using some mind tricks, you can transform a small family bathroom into a functional space for the whole family. When you choose bathroom furniture with extra storage spaces, you can clear off the vanity top and make your bathroom less cluttered. Consider adding a large medicine cabinet instead of a mirror. Toothbrushes, medicines, and lotions can all be tucked inside and out of sight. Hanging an over-the-john cabinet is a great way to utilize a big empty space and get even more bathroom items out of the way. 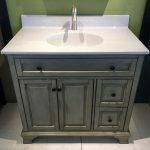 Remove your large vanity cabinet and install a compact pedestal sink with storage. 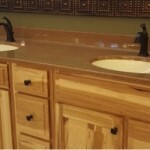 Pedestal sinks generally do not extend as far from the wall, leaving more room for people to pass through. If you can’t bear to give up a larger vanity, consider installing a wall-mounted one instead. The extra floor space can be filled with baskets and makes cleaning the floor a breeze. Replacing your dull light fixtures with brighter ones can make your space feel much larger. Bright lights can fill dark corners with light and make you realize how much space you have available. Mirrors reflect the light, so a large mirror will make your bathroom feel more spacious as well. Shower curtains make bathrooms feel smaller and darker than they actually are. 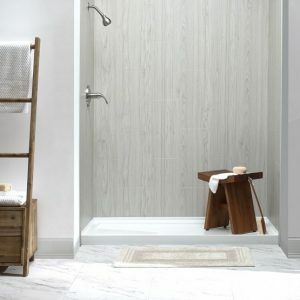 By adding a frameless shower door you can trick the eye into feeling like the space is more open. An added bonus of adding a shower door is the ability to mount towel bars directly on the door. This clears up the walls and instead allows towels to dry in a space that wasn’t utilized before. Wall color can make or break a small bathroom. Choosing lighter paint colors opens up the space and makes it feel much larger. As seen in The Hood Magazine September 2018.